I'd seen this recipe for Easy Dump Cake all over the place. I found cake mixes for $.99 at the store so I bought a bunch to have on hand for quick desserts. I found a Sprite hidden in the back of the fridge and the kids had a sleepover so I figured this was the night to make this cake. I always have frozen fruit on hand. We make smoothies for breakfast almost every morning. 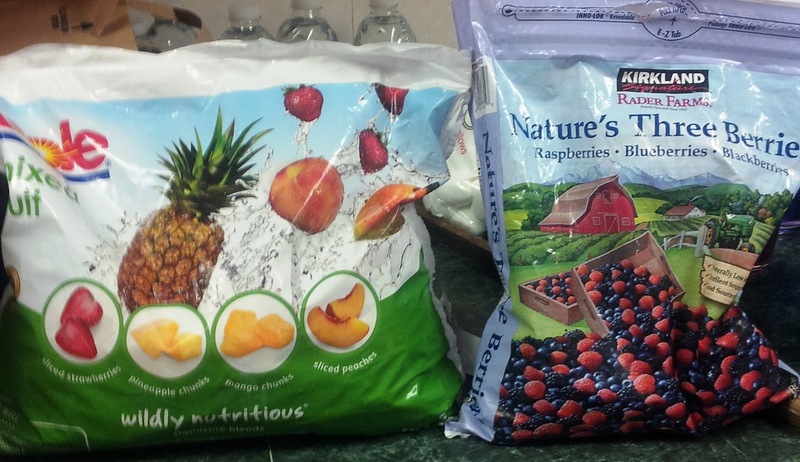 I buy the huge Costco sized bags of fruit. For this cake, I used a mixture of berries, peaches, pineapple and mango. You could really use any fruit. Just berries, just peaches, whatever floats your boat. The fun thing about easy cakes is that there are always plenty of hands available to help. 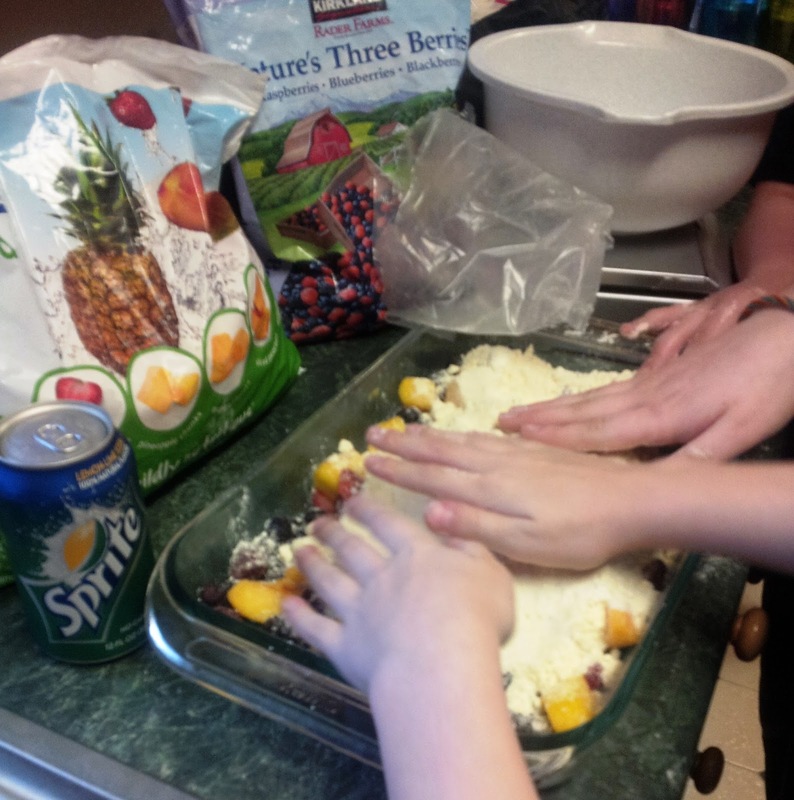 All I did was measure out how much fruit we needed and the kids did the rest. The kids were skeptical about how it would turn out and I admit, I wasn't sure myself. It did seem a bit odd. 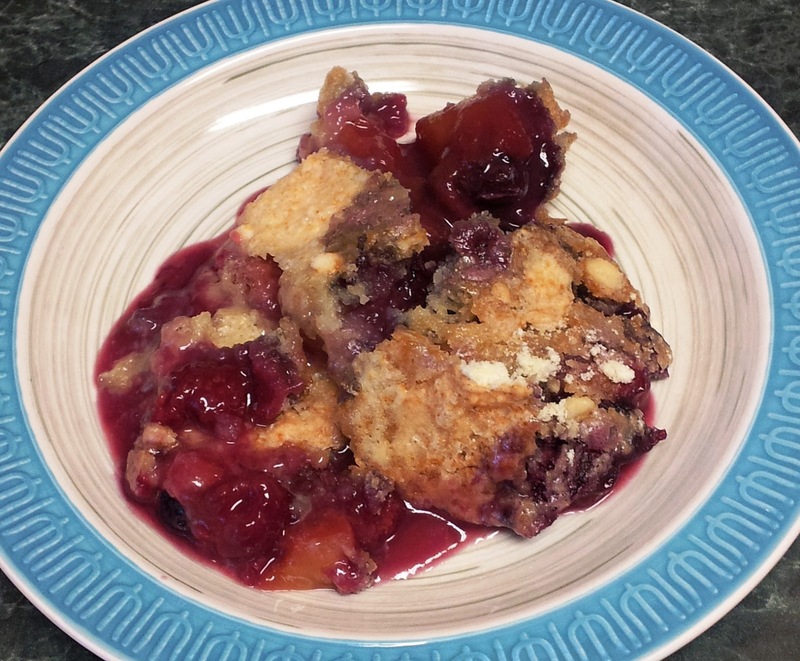 I thought the top would still be dry and crumbly. How wrong I was. It turned out perfectly! The kids loved it and we finished off the pan in no time. 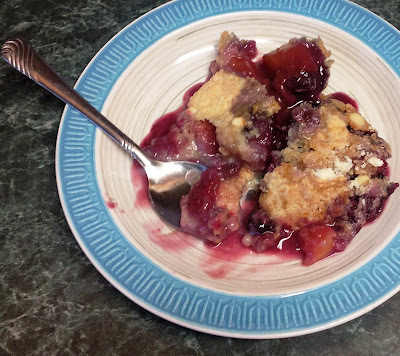 I loved the mixture of the berries with the peaches and mango. While I thought the mixture was perfect, I can't wait to try this with a different combination. Looks like I might have to buy more Sprite! 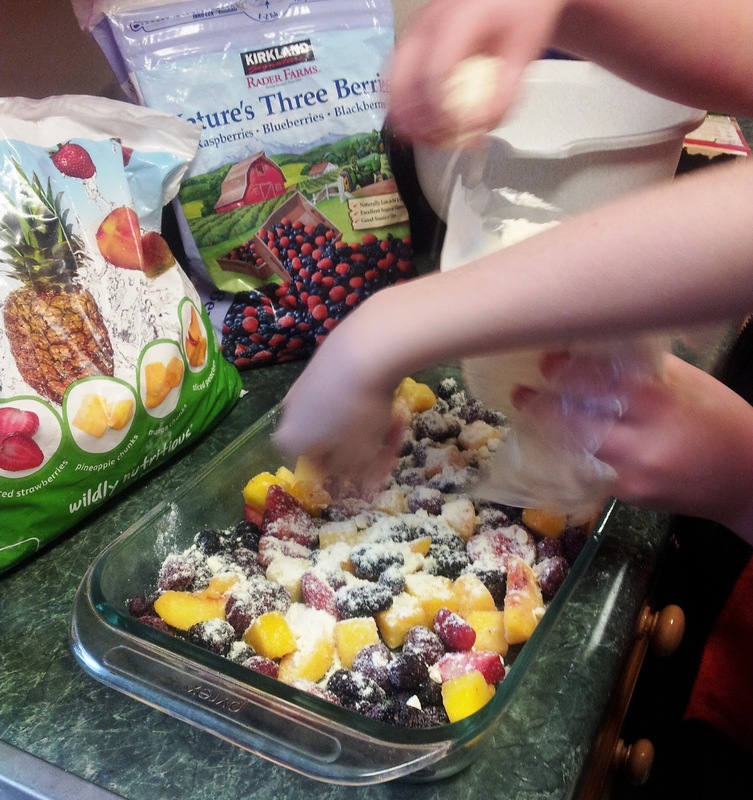 Put frozen fruit in a 9 x 13 baking dish. 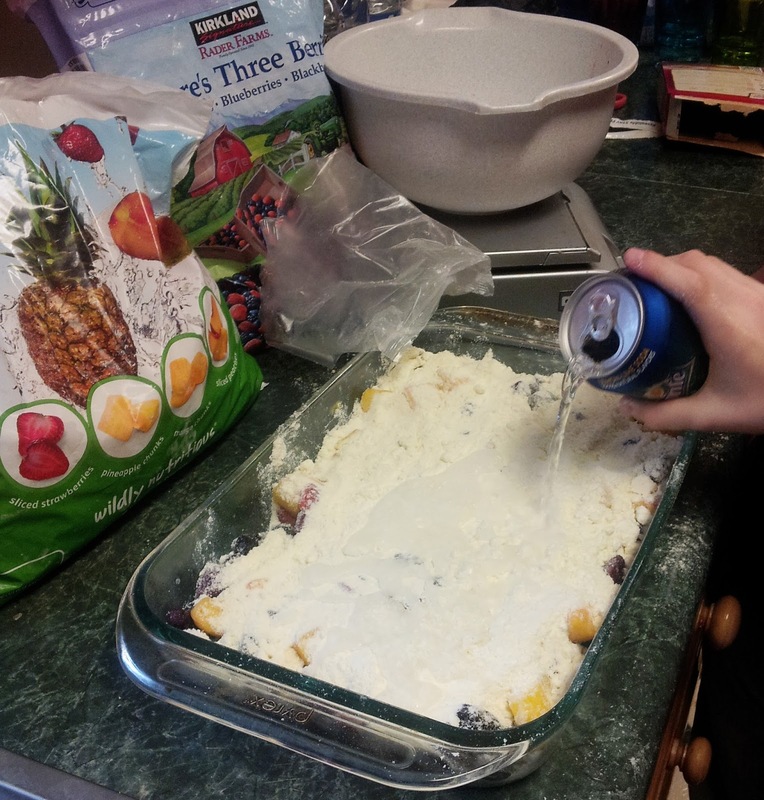 Add dry cake mix over the top. Pour soda slowly over the cake mix. DO NOT STIR. This will give you the "crust" for the cobbler.